Large Dutch Solid Silver Spoon Windmill motif Handle w Moving Blades. 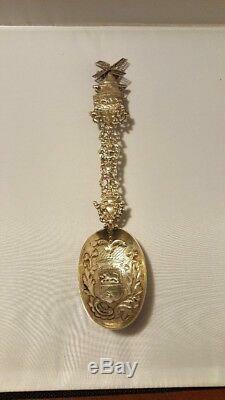 Item is an excellent Dutch silver (800 fine) spoon with a figural Windmill pierced handle. The excellently detailed figural windmill at the top of the handle is great with movable blades and intricate open work (repoussé) and filigree decoration on the handle leading down to the bowl. This is a quality item for the silver collector of history and it will make a great addition to almost any service or table setting. Total length:11 1/2 inches. Bowl width: 2.2 inches. Bowl length: 3.3 inches. Weight: 4.5 troy ounces. The item "Large Dutch Silver Spoon with Figural Windmill Handle Motif" is in sale since Sunday, January 21, 2018. This item is in the category "Antiques\Silver\Sterling Silver (. The seller is "constructu" and is located in Bedminster, New Jersey. This item can be shipped worldwide.